The ladies at the post office know everything. We received a Christmas card a month late the first year we arrived in Cradock, brought to us by our neighbour across the road, Frans Smit. We weren’t disappointed in the crap postal service, and I didn’t curse anyone’s ineptitude. In fact, my husband Chris and I stood staring at the envelope in silent awe. It had come from my Uncle Peter and Aunt Cathy in Germany. There was no street address, no postal code, no province. My uncle had found an email where I’d told him about our new life (and neighbours) in this small Karoo town, but couldn’t get hold of us to find out our postal details in time. Yet the fine ladies at the local post office (I have discovered) know all. They are super-efficient and kind, and on occasion even remember our birthdays. They wish us well by stuffing greetings into our post box. Would this ever have happened in Joburg? I think not. Here’s something else that would never happen in Joburg. In the big city, a visit to the hairdresser for highlights, a cut and a blow-wave cost around R700. The price alone made every haircut an ordeal for me, let alone the faint air of disdain emanating from the super-trendy customers and staff. Carozel Ferreira and Rosie van Jaarsveld of Turning Heads, with Veruschka and TC. 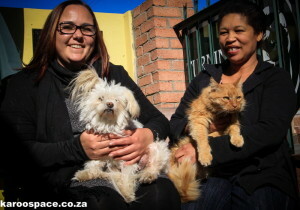 In Cradock, I go to Turning Heads, which is right next to owner Carozel Page’s house. While she and Rosie wrap my hair in foil, various cats might compete for my lap. Then we have a comfortable chat about the latest books we’ve read and the current town gossip. At the end of it, Carozel charges less than half of that, and my hair looks better than it ever did in the city. When Chris goes in for his “Number Two Special” it’s a five-minute job for a meagre thirty bucks – and looks every bit as well-barbered as a city cut. And another thing. People here also have the charming habit of haggling themselves down before you can even say a word. Like the time we went to a national courier company with a branch in Cradock. We had heavy laminated documents, plenty of them, that HAD to be in Johannesburg the next day. We knew it was going to cost us a bomb. The courier man loaded the stuff onto the scale and gave a small gasp of horror. “Are you sure it has to be there tomorrow? If it doesn’t, I can charge you less,” he began. But there was no choice. The stuff was urgent. Reluctantly he showed us how much it would cost: nearly R600. We shrugged in acceptance – it was a price we’d pretty much expected. “No, no,” he muttered to himself. “That’s too much money. How about this?” He wrote down another price – R150 – on a piece of paper, and looked at us enquiringly. “How about we make it an even R200?” offered Chris. Sunday lunches only end for naps. Of course, it’s not always idyllic. Unlike life in a big city, where you where you wear anonymity like an invisibility cloak, you are painfully exposed in a small town. People you’ve never met know who you are, and will wave at you in passing. For the first few months, we became quite paranoid. “Who was that?” we’d hiss at each other. Even worse, people you don’t know will happily tell you they saw you the previous day at such and such a shop, and even what you were doing or wearing. It’s unnerving. But eventually you get used to it. In fact, you feel sorry for people from the city who daren’t even look a stranger in the eye for fear of an unwanted encounter. Here we look at each other. We nod or smile in greeting. Everyone is acknowledged. We know the names of the informal car guards at the shops. And so what if a ten minute visit to the shops takes an hour because you’ve met so many friends? It’s not like you have to race home to beat the traffic. The only deadline you have to beat is the one that dictates that most shops in the platteland close for lunch – a very civilised way to break the working day. Hoe verlang ek terug na daai dae!! I think I want to move to Craddock…. I’m so tired of being in the city! 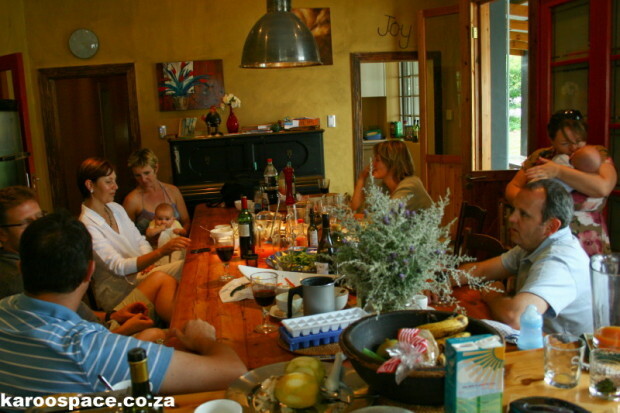 Ai…al bly ek nou al jare nie meer in cradock nie….it will always be home. just done the Great Karoo Cycle, ending in Cradock. Absolutely fantastic. 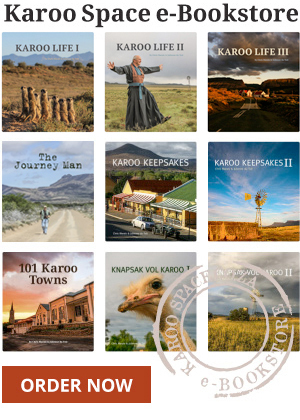 Been in love with the karoo since I was 8! Would love to relocate. I’m a passionate cyclist, historian, schreiner aficionado : I think Cradock’s the place for me! Hi there Neil. 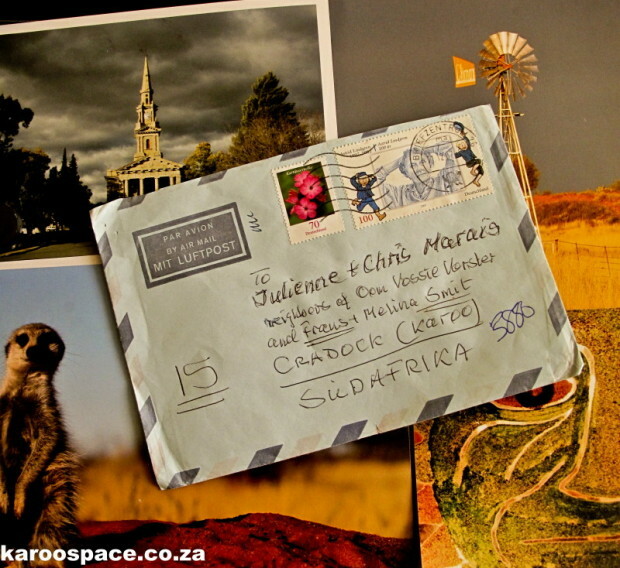 I’ve forwarded your query to Visit Cradock. They said there was a place at a lovely guesthouse where there was a cancellation and that someone would call the guys. Thanks! Excellent! That’s awesome. Much appreciated.Julienne you are so kind and helpful. Have a great day. Your article made me want to re-locate! My husband and I have been craving such a dorp lifestyle for the longest time. The link was forwarded to me by my father, Pieter van Zyl, in a manner of pride, and I can see why. I enjoy your comfortable writing style and will certainly now be reading your work on a regular basis. Leave a Reply to Daleen Pieters (nee van Zyl) Click here to cancel reply.